I Have a Voice – seek. follow. love. 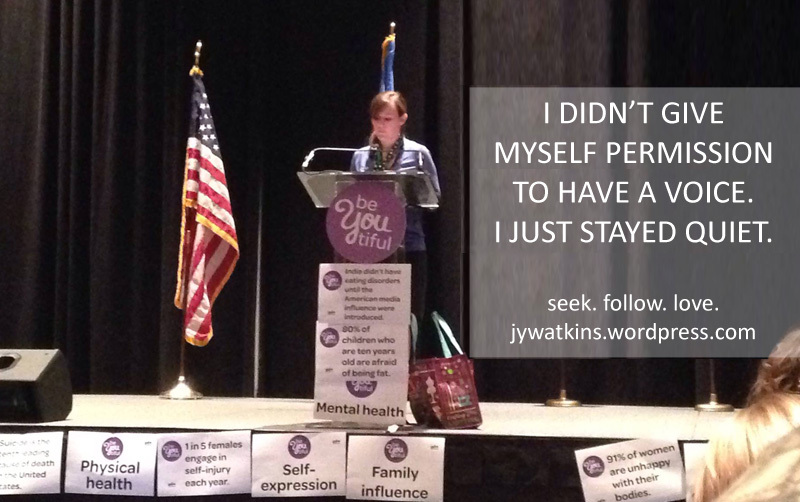 Last October, I worked at a girls’ leadership conference. My team and I trained the adult chaperones on how to guide the teen girls through community projects that addressed one of several social justice topics. The goal of the conference was to empower the girls to find an issue in their community and address it to make a positive impact on their world. Imagine it– 1,100 girls working to make positive changes in their community, state, country… It really was as impressive as it sounds, not least of all because I know they can do it. Working with the adults, I led one workshop and helped facilitate several others, equipping them to help the girls pinpoint the issues they wanted to address, come up with possible solutions, and then build a plan they could carry out at home. Near the end of the conference, it was decided that the information I was giving the adults during my workshop would really benefit the girls, so would I speak to the girls? All 1,100 of them. From a stage. At a microphone. Growing up, I was quiet. I sank into the background and that’s the way I wanted it. Looking back now, I know I let my self-consciousness get the better of me for years. I was quiet because I didn’t want to be noticed. I didn’t want to be judged, scrutinized. I was smart, always the top in my class, but still so afraid that if anyone looked any closer, they would see I was plain– smart, but nothing special. I rarely raised my hand in class, even if I knew the answer, because I was either too afraid of being wrong or too afraid of being right. One meant that the only special thing about me– my intelligence– was a farce. The other meant having people look at me, see me, maybe even think that I was showing off. No, I didn’t want any of the attention, good or bad. This became a defining feature of who I was, or at least how I saw myself. I was smart, but quiet. Quiet. It’s like an insult to my adult ears, because I know now that I didn’t give myself permission to have a voice, to be smart, to be wrong, to be right, to be me. I just stayed quiet. Senior year, as graduation approached, I was still in the top of my class– the very top. The top two students in the class would give speeches at graduation. It could have been me. When it came down to it, I was third and pleased with that– as high as possible, without having to give a speech. No one would be looking at me. In my thirties now, I know that being number three in your class is just about as good as being number one. I had college acceptances and scholarships and in the end a ranking doesn’t define who you are anyway. But I also know I robbed myself, not of boasting privileges, but of life experience– public speaking experience, sure, but also the experience of being proud of my accomplishments and unashamed of being who I am. Thankfully, something finally gave way in college and I stopped caring so much about what everyone else was thinking of me and started caring about what I thought of me. I started believing I was enough and I was worthy of being seen. I still come off as quiet, especially with new people or in large groups, because there’s some things that will never change about this introvert, and because my struggle with confidence is not completely gone. But I also speak up now. I contribute and participate and lead. And when someone says, you should get up on the main stage at the conference and speak to these girls, I say yes. There are people in my life, now and from my past, who wouldn’t imagine me standing on a stage, in front of microphone, rallying 1,100 teenage girls to use their smartphones to plan a project that could change the world. But I did it. And it was amazing. Because I have a voice. And so do they, and I hope everyone of them knows it. Thank you for causing me to think and be bold. I have always spoken up, because in my house you had to, but I always thought what I had to say was unimportant, people really weren’t listening, that I couldn’t add to the conversation or cause change for issues I really cared about. You help me daily to know that somewhere, someone is listening and we have to contribute. I also think that’s a great way to put it: “I didn’t give myself permission to have a voice.” Far too often we are our own critics. I know I am a lot of the time. I can hear other people tell me how good I will do or how well something will go, but I still have doubts. And I’m still afraid sometimes. I wouldn’t describe myself as quiet, normally, but I do often find myself staying silent for one reason or another. “They don’t care what I have to say.” “It’s not really that important.” “I’ll just make people angry.” And so I don’t speak up. I’ve been trying to challenge myself to say something anyway because I’d rather be a part of the conversation than just a bystander. Me too. I’d rather be part of the conversation. That was our thing in elementary school…blend in, don’t stand out, just be quiet. I also had to learn to speak up, lead the way, and find my voice. I love the way you define it as ‘giving myself permission to have a voice.’ I’m not sure most people view it as they are the ones holding themselves back. Yeah totally. I’ve learned that most of what I was afraid of– being ridiculed or teased or whatever– was mostly in my head anyway. Sure, kids make fun of each other, but I doubt it would have ever been as bad as I made it out to be. And you get over it most of the time anyway. I definitely had to give myself permission.